There are other reasons I ride. 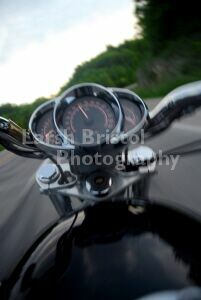 Motorcycle riding is the best fun you’ll ever have exercising your mind and sharpening your reflexes. Or the wind through your hair: I’ve heard that feels real good, but the top of my head just gets burnt. Solitude, thrills, the unexpected, and the rush, that adrenalin rush that I’m too out of shape to get anymore climbing mountains, or not talented enough to feel on a race track. These are all valid sensations when you’re riding; but what gets you to straddle a powerful engine resting on two spoked wheels that is producing enough power and vibration to make even the most innocent smile? I’m concentrating so hard on the texture, feel, and smell of the road, that there’s no time left for what happened a day, an hour, or even a minute before. Therein lies the freedom of motorcycle riding, the freedom we talk about every time we talk about motorcycles: thinking of nothing but the slice of time you’re passing through at that moment — the freedom from daily life, even for a day, or even an hour. Remember that television show called “Bronson”? It was about a guy traveling around the country on his motorcycle. This guy got to wear jeans and a worn leather jacket everyday. Ruggedly handsome, dripping with macho confidence, and emitting enough testosterone scent to turn wild animals to rut. Bronson went from working as a cowboy (bikers on one horse instead of 70) one week to being a lobster fisherman the next. He stayed in one place only long enough to save a local child’s life or to have the only single and most beautiful, mysterious woman in town fall in love with him, or both. Cool. Just when you think he’s settled in one place, found a home, become one of us — BAM– he packs his shaving cream and toothbrush, kisses the girl good-bye, and hits the road. Remember that show? That’s who I am when I’m riding. Going nowhere or everywhere. Me, the bike and the mystery of the road. And that’s a damn good feeling. Most of us could never have, or probably really want, Bronson’s life — we like stability in our lives — but when I’m on that bike that’s all I am or want to be. The hell with responsibility. Even if it’s only for an hour once in a while, it’s enough and never enough, at the same time. Ride hard, ride often, ride safe, but ride. This essay first appeared in The Tapestry magazine (Vol. I, No. 5. Oct., 2002).